Home > Investor Awareness > New Financial Planing : Salary = Fixed costs – Investments – savings – expenditure..! New Financial Planing : Salary = Fixed costs – Investments – savings – expenditure..! Personal finance writers believe about 10% of your income is a good amount for investments. Again, if you figure you had give more importance to future goals over current expenses, you can buck the trend. In fact, you can make investing as much as about 30% of your monthly paycheck, as I have often done in conducive times. When you have shortlisted the major goals you had like to invest in and then proceeded to fund them, what remains from your monthly salary is for short-term savings and finally current expenses. Often misunderstood and misinterpreted with investing, we save in places where we should have been investing in the first place. To avoid this mistake, the savings bucket can be categorized into two: Short Term Goals and Recurring Expenses. Expenses that are recurring every year (Diwali, Vacation etc) come under the recurring expenses umbrella. We will save toward these expenses by opening separate Bank or post office RD’s in their name drawing from your salary account. Short-term goals such as a car, down-payment for a flat /home, your wedding come under this umbrella. While these are not repetitive, they are forecast to happen a few years down the line. The reason we do not invest in the equity /share market for these goals is because they are too near. Returns over the short term in equity is not guaranteed and that’s why we save under the safer neighborhood of a Bank’s or post office’s RD. The returns are definite, risk is negligible and we can save with precision. To differentiate short-term goals from long-term, take the golden number as five years. If your goal is only 5 years away, save using a bank’s RD. If longer, always invest some portion in the equity market or equity mutual funds. Now, as you have detailed into the saving bucket, you can allocate the percentage to each goal. Depending on the importance you have for each expense, you can divvy the amount accordingly. From the monthly salary, as you take out fixed costs, investments and small-term savings, the balance remains for irrational expenditure – FINALLY! Imagine the feeling you had have when someone gives you money with no chip on your shoulder: No worries over the future nor any pre-determined commitments to fulfill (ex: parents’ housing loan). Being brought up in a middle-class environment made me acutely aware that there is some responsibility perennially hanging over one’s head. As I grew up, my mom had to keep working to keep me educated. As time progressed she wanted something for herself but it wasn’t possible always. An impulsive purchase or miscalculated expenditure stung for days. Seeing what my parents had been through made me realize that having some amount for irrational expenditure is a saner version of living life. Funding my future needs first, I could rely on this feeling of being assured for the remainder of the month. This sort of represented, that I have done my homework before I spent the evening at the park. Most of the friends I know have kept 15% to guilt-free spending. But you can accord this portion depending on your conscious spending plan. To sum up, your monthly money table will look like this. Mr. Ashwath was a classmate of mine with whom I walked through the 4-bucket system. Mr. Ashwath decided to allocate his salary in terms of % as below. Per his next-100 breakdown, 15 would be toward fixed costs like car EMI and petrol. He does not have more fixed costs because he stays at home with his parents and has no student debt. With his investments, 5 goes toward the employer match EPF and another 5 toward a Nifty 50 Index fund for retirement. About 30% of savings splits between 25% for a house downpayment and 5% for Himalayan trekking expeditions that he does every year. The remaining portion of 40% to-50% from guilt free spend gets spent irrationally. When he finished working this out he exclaimed, “Unbelievable!! !” and stopped speaking for a few minutes. Since he works in technical sales at Saint-Gobain, he gets to travel a lot and eating out is his second giving of life. To impress clients, he spends quite a lot on clothes too. When he automated this allocation, it seemed unreal. Previously, he used to do things with money haphazardly. Now, he knows how much he can save, how many designer ties he can buy and how many times he could eat out. Automation made sure the money from the salary account was disbursed into each bucket appropriately without him thinking about it. 1. Right when the salary is to be deposited, 5% goes toward the employer EPF match. 2. A day later, an additional 5% gets pulled out for investing in a Nifty 50 fund – towards retirement in addition to EPF. 3. Three days later, the fixed costs are paid from the salary account – car EMI (he has a lot of travel). 4. One day later, he pays the credit card balance for the irrational spend and fuel costs of the previous month. 5. The same day, 30% of savings are siphoned – which automatically spread into 25% for home down payment and 5% for vacation treks into two separate RD’s. 6. Whatever remains, he gets to spend it irrationally. Nominally, he uses a credit card/ Paytm wallet to pay so that he can keep tabs of his financial situation. When the 20th of the month rolls around, he looks at his bank balance and makes a frugal living for the remainder of the month (if he’s over-spent before). After he’s automated everything, I’ve seldom heard him say, “It’s the month end and my finances are tight, bro.” In fact, he never cancels on an eating-out plan due to finances and he’s spent a grand total of 1-hour managing money. This is automation at its finest exploitation! As you’ve automated, the tangible result is: you need less than 5 minutes of work per month and you’ll know how every gear of the bigger machine is working. Now, you could actually dream about spending more time with kids or having bigger vacations – your money life is sorted. If you had like even better tips for how you can leverage cheap travel – flights that just cost 200 from Mumbai to Entebbe, automate your finances and be something of a Jedi-master of money, we hve compiled everything into 166 pages. Right now, I’ve co-authored a lifestyle book with Pattu of Freefincal that delves into personal finance, cheap travel, credit cards, automation and many more. Get your copy on Amazon right here. It hit the shelves on 2017, June 2nd and is already on it’s way to becoming a best-seller. If you are ready for some advanced material on travel, make sure to grab a copy of the Ultimate Travel E-Book. It has earned generous praise and people have emailed in saying they’ve secured flights for half the price than they normally find after reading the E-Book. 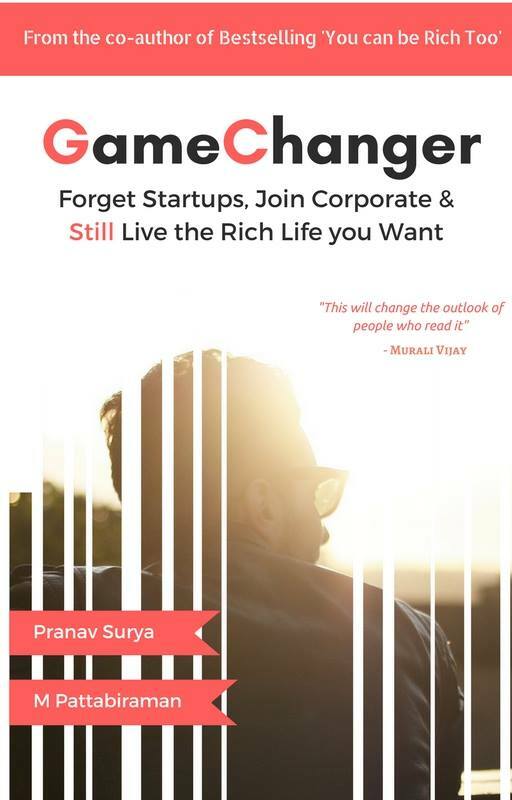 Mr.Pranav, the co-author of the book “GameChanger”. Pranav Surya with an MBA in Hospitality & Tourism at Glion & Bachelors in Mechanical Engg. He did a project at Bosch Bangalore which was when he realized engineering wasn’t for him. Upon asking multiple people from different industries, moved into hospitality and tourism and right now have traveled to 9 countries across 3 continents for work and some leisure. He can be found half of the time at Anna Centenary Library in Chennai and the other half traversing across the globe for work.